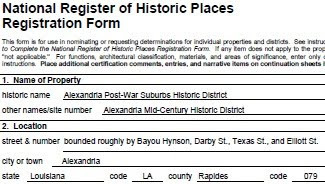 Alexandria Post-War Suburbs Historic District: Historic District Meeting - Monday, 4/22, 6 p.m. Historic District Meeting - Monday, 4/22, 6 p.m. Please join us for a neighborhood meeting to discuss the proposed historic district. When: Monday, 4/22, 6 p.m. - 7 p.m.
Where: Emmanuel Baptist Church, Fellowship Hall, 430 Jackson St.